Dubai UAE, December 7, 2015: Bite into the rich allure of Nutella in Nutella filled Pastry Pockets as they make their debut in participating Tim Hortons baked goods showcases across the GCC region. 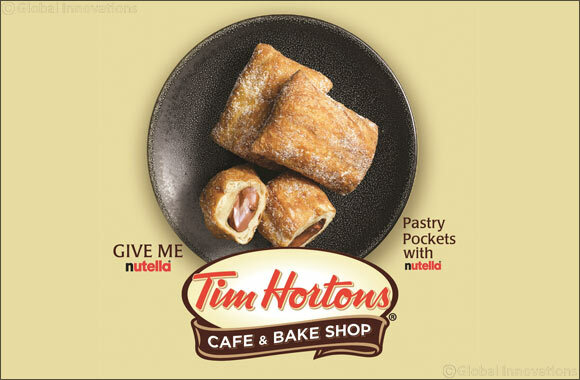 Taste buds would be pampered with the all new Nutella filled Pastry Pockets that is exclusively launched by Tim Hortons from December 1. The blend of fresh taste of Tim Hortons baked goods with Nutella to create a phenomenal flavour pairing would entice you to come back for more. This is a melt-in-your-mouth, must-try treat; a delicious combination of flaky pastry filled with Nutella and dusted with sugar launched across the stores including UAE, Qatar, KSA, Oman, Kuwait. Nutella filled Pastry Pockets has been doing the rounds in the stores, adding to the fun and fervour of the Tim Hortons' guests present at the venue. It also grabbed attention on various social media platforms with a plethora of posts and tweets using the hashtag #PastryPocketsWithNutella. Let a dollop of Nutella in every bite, wrapped with a light sugar-coated pastry beckon you exclusively at Tim Hortons this festive month.